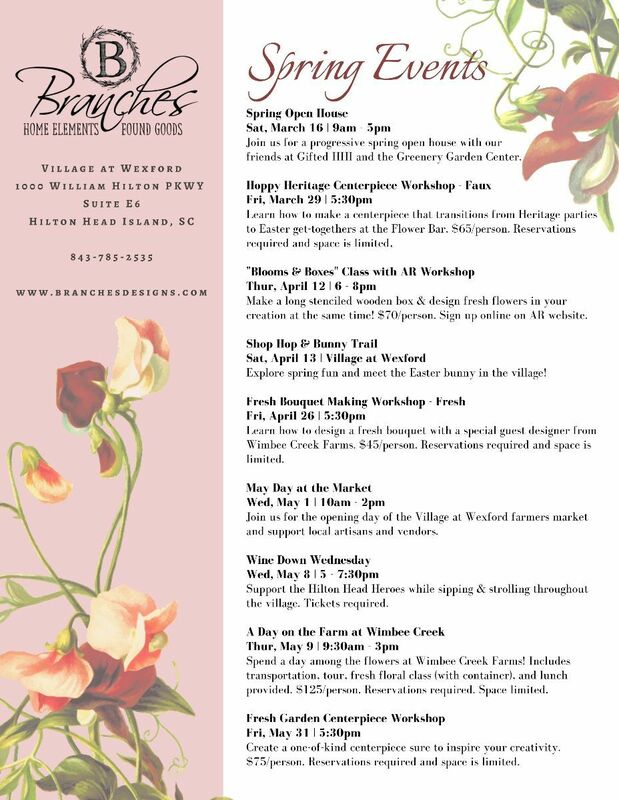 Spring Open House 2019 at Branches! We love the start of spring, especially when it means opening our doors to the shop and celebrating a beautiful new season ahead! Our Spring Open House on March 16th, 2019, was an absolute delight as we were surrounded by local artisans, delicious treats, long-time customers, and new friends. Thank you to the Flour Pot Baker for all her amazing goodies; Carin Vaughn for bringing her beautiful art; Emily Boatwright of Haven ERA Designs for creating one-of-a-kind pieces; and Maria Baldwin of Wimbee Creek Farm for bringing stunning blooms for party-goers to take home. Want to stay up to date on our upcoming events? Download our calendar HERE and don't forget to join our newsletter to get updates on events, Pie Day Friday specials, deals, and news.